During the interview given to the American television in April 2016, US President Barack Obama admitted that the US policy toward Libya, after the fall of Muammar Gaddafi in 2011, was a mistake. Consequently, the public opinion in the United States has focused once again on current situation in Libya. Furthermore, it is worth emphasising the fifth anniversary of the Libyan Revolution this year. The revolution (as a part of the Arab Spring) has permanently changed this North African country. There is no doubt that after 5 years of a civil war, Libya has become ‘a black hole’ of the regional security and one of the three most destabilised states of the MEAN (Middle East & North Africa) region, along with Syria and Yemen. Nowadays, Libya is divided into two parts, led by two separate governments and parliaments (in Tripoli and Tobruk) fiercely fighting each other. The country is plunged into a series of ethnic, tribal and religious conflicts. Despite formal agreements of the United Nations, the country is a typical failed state, where the lack of a central government leads to total chaos and anarchy that constitutes perfect conditions for various extremists and common bandits. Furthermore, these circumstances are used by jihadists from both the Al-Qaeda and the Islamic State (IS), as well as other organisations and criminal structures that start to perceive migrant smuggling into Europe as one of the main sources of income. In many cases, these ‘civilian’ crime groups are related to the activity of jihadist structures. All these organisations and structures create together a specific network of connections. It is a common situation for all North African and Sub-Saharan African states, which has extremely negative consequences for the security of all the countries in the region, spreading destabilisation to more distant countries of Africa, Middle East and even to Europe. Since 1990s Libya has become extremely vulnerable to the activity of radical Islamic organisations. It results mostly from Libya’s topographical relief, particularly its southern interior (deserts and semi-arid regions) as well as its favourable location in the region. Libya’s southern regions are uninhabited and hard to reach, however it is worth emphasising the proximity to the mountain areas of southern Algeria (which is the base of the Armed Islamic Group of Algeria) as well as the territories of Niger, Chad and Sudan (the country is plunged into a bloody civil war with its explicitly religious, anti-Christian context), and Egypt, with its rebellious Islamists from the Muslim Brotherhood and Egyptian Islamic Jihad. Egyptian jihadists have been regularly taking refuge on Libyan territory, efficiently importing radical Islam to this country. The violence and fierce efficiency of Libyan special services was sufficient to restrain jihadists (particularly of local origin), forcing them to operate overseas. It is not surprising that Libyan citizens were one of the biggest “national contingents” in the terrorist structures operating in the countries such as Algeria, Iraq (after 2003), in the Sinai Peninsula, Yemen, as well as in Afghanistan and Pakistan. After 2011, Libyans have joined en masse the structures of radical jihadist organisations in Syria as well as in Libya, where political and religious radicals have hijacked authentic, grassroots protests and demonstrations. In Libya, along with Egypt and then in Syria, it turned out that the most efficient and well-organised structures were related to jihadist organisations, consequently they took control over the revolution. The consequences of this process became visible sooner than expected. The situation was quite obvious, despite the fact that Western countries, which were instrumental in overthrowing Gaddafi, made efforts in implementing new categories and definitions related to the supporters of radical Islam in Libya (but not only) by dividing them into ‘moderate’ and ‘radical’ groups. At the gates of Europe, particularly nearby its weakest part (the European Union member states located in the Mediterranean region, especially so-called PIGS countries) the new centre of radical Islamic extremism has risen and it is strictly associated with Al-Qaeda in terms of structures and members. Furthermore, the most radical Islamists have become more powerful as in Syria. The situation turned out to be much worse when the first structures of the so-called Islamic State appeared in Libya in late summer of 2014. 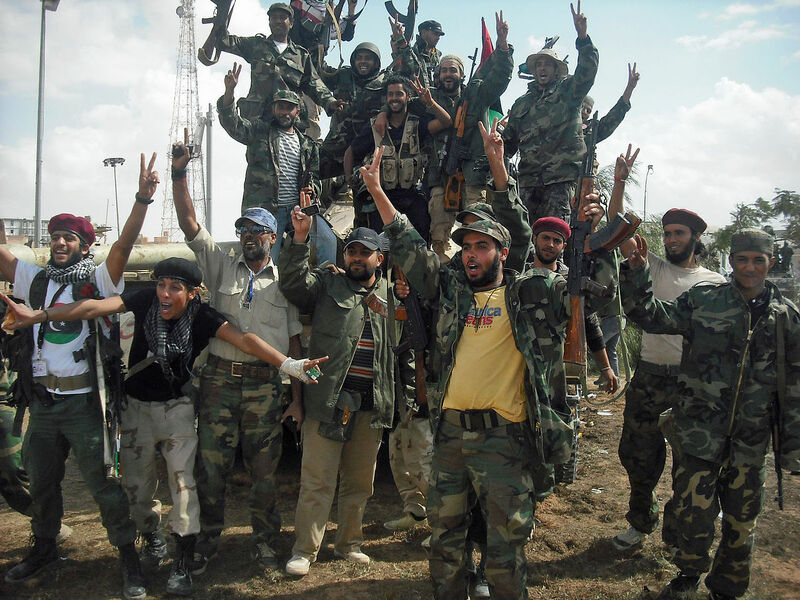 Their dynamic growth led to the overall change in the operational and strategic situation in the Libyan Civil War. Since then, the war has become more chaotic and unpredictable, and its general image seemed to be similar to the situation in Syria in the last few years. Sirte, located in the central part of the Mediterranean coast, has become the stronghold of the Islamic State, from where the Islamists of the Caliphate coordinate their operations in the eastern, western and southern part of the country. Despite jihadists’ efforts to enlarge their territory, the combat-seasoned armed forces of gen. Khalifa Haftar put up fierce resistance against Caliphate’s soldiers. Moreover, the Islamic State’s troops keep fighting against other Islamic groups loyal to Al-Qaeda in Derna in eastern Libya. There is no denying that the city is a symbol for the Islamic State. The first emissary of the Islamic State, who was anointed by the Caliph himself, arrived to Derna in the summer of 2014 in order to build the first structures of this organisation in Libya (Derna was the first “colony” of the Islamic State in the North Africa, and its first overseas province, Wilayat al-Barqa). However, Derna is also an important symbol for the Islamic State because of the historical reasons. The town was established in the late 15th century by Muslim refugees from Cordoba, the last Moors expelled from the Iberian Peninsula after the final success of the Christian Reconquista in Spain. Therefore, the conquest of this town has almost the mystic significance, showing both the will and determination to reverse the history of Islam and events that took place over 500 years ago. Jihadists from the Islamic State take their mission of establishing their new structures in Libya seriously. The Islamic State has become one of the most important actors of the Libyan drama in less than two years. Their significance and position in Libya is even more visible if we consider the establishment of further two provinces (wilayat) giving them an access to the entire Libyan territory. Besides al-Barqa (Cyrenaica), which was mentioned before, the jihadists have taken control over al-Tarabulus (Tripolitania) in the West of Libya, as well as al-Fizzan (Fazzan region) in the South. The structures of the Islamic State currently seek to take control of further important positions located on the coast (e.g. Sabrata, which is the main centre of illegal migration to Europe). The deepening conflict in Libya is conducive to this situation. Taking into account the political and military chaos in the country, the experienced, disciplined, well-motivated and well-equipped troops of the Islamic State are the power that actually has no competitors in Libya. At least as long as this devastating civil war will not finally come to an end. There is no denying that further successes of the Islamic State’s fighters in Libya are just a matter of time. It is worth mentioning that most of troops of the Islamic State in Libya consist of foreign fighters. However, it would seem certain that the further existence and development of the overseas provinces of the Caliphate in Libya will increase a number of local fighters-volunteers joining forces of the Islamic State. In consequence, it will make Libyan society even more radical and it will certainly deepen chaos in the country. This scenario is becoming more and more possible, because finding a political solution of the current situation seems to be very difficult. Despite formal diplomatic successes of the negotiations concerning the peace treaty that would end the conflict, which lasts several months, there is little chance to resolve the dispute. The situation has not been improved by establishing the Government of National Accord under the aegis of the United Nations, led by Prime Minister Fayez al-Sarraj. Each of existing centres of power in Libya claims to be the only legal Libyan government, therefore, the previously established governments decided to stand together in fight against the new political centre, which wants to take control over the entire country with the support of the United Nations. However, the position of the previously established centres is strengthened by their military power. The current situation at the front lines is proving the political deadlock as well as the deep crisis in Libya. Due to the activity of both the Islamic State and jihadist groups associated with a number of Al-Qaeda’s branches (both foreign and native Libyan organisations, such as Libyan Ansar al-Sharia and Abu Salim Martyrs Brigade), the present nature of the war in Libya has changed its dynamics. Religious factors are becoming more and more important, beside previous, typical tribal and ethnic disputes. There is no denying the fact that Libya has become the regional centre of illegal migration and these circumstances do not foster the reconciliation between sides of the conflict and the end of the civil war. Nowadays, due to the civil war, Libya is the root of security threats not only for its close geographic environment, but also for distant regions, such as Europe. In the latter case, threats and challenges resulted from Libyan chaos are mostly related to the mass inflow of illegal immigrants (organised on an almost ‘industrial scale’) that storm southern borders of Europe from Libya. Contrary to Syria, which has become the largest source country of refugees and migrants on the 5th anniversary of the Syrian civil war, Libya is only a transport hub for hundreds of thousands of inhabitants of Sub-Saharan region and East Africa (particularly from Horn of Africa), and an intermediate step on the way to the European “Promised Land”. The Libyans themselves seldom migrate into the countries of the Old Continent, however they are beneficiaries of large-scale migrant smuggling into Europe. Both organisers and contractors make a fortune from migrant smuggling, therefore all sides of the civil war (regardless of their political, ideological or ethnic background) are involved in this process. It would seem certain that particular parties and groups in Libya take advantage of the chaos in the country in order to sustain favourable conditions for further development of extremely profitable smuggling of migrants (and illegal drug trade) to Europe. According to the government of Italy, the human-smuggling business to Europe can be worth up to 10 percent of Libya’s GDP. In 2015 more than 150 thousand immigrants arrived to Italy using the Libyan route (unofficial data). This number seems to be relatively low in comparison with the mass of migrants that moved to Europe at the same time using the Balkan route, however it is worth emphasising that the entire process of migrant smuggling from Libya into Europe is still in the early stage. Consequently, it would seem obvious to expect an increasing number of migrants from this direction. Furthermore, taking into account cooperation of the European Union and Turkey, as well as their solutions to decrease the inflow of illegal immigrants from Turkey to Europe (Turkish route), the significance of Libya as the centre of migrant smuggling will certainly increase. Particularly after considering the fact that each person who wants to move from Libya to Europe is supposed to pay for the ‘trip’ from 800 up to 1000 USD. The international community, particularly European countries and the United States, should lead to a political breakthrough in Libya as soon as possible in order to put an end to the conflict between competing governments in Tripoli and Tobruk. The Government of National Accord established under the auspices of the United Nations must receive wide support of the international community, also in the military if it is necessary. There is no doubt that these steps are indispensable to foster the process of political recovery in Libya and establish new structures of both the state and administration that would control the country and ensure its security. The political breakthrough is crucial to prevent an issue of illegal migrant smuggling into Europe. The European Union must strengthen its control over the southern border in the Mediterranean region as soon as possible. However, the EU has to stop the process of migration, instead of providing logistic support and mechanisms of bureaucratic control as is happening now. ‘Operation Triton’ is not efficient enough to stop further migration. The purpose of this operation is formally to protect the EU’s external borders under the auspices of the agency FRONTEX, however, in fact this operation seems to be a humanitarian mission in order to rescue immigrants travelling to Europe aboard broken-down ships and saving those who are not able to get to Europe on their own. The countermeasures of the several European countries involved in this action (not only from the EU) are actually against migrant smuggling from Africa into Europe. The European Union has to change its approach to the issue of migration from both North Africa and Middle East. In case of Libya it is necessary to establish a primary principle (and spread it to all countries of Maghreb) that all boats with immigrants will be turned back and escorted on the way back to Libya. Only this action of European countries could prevent migrant smuggling business in Libya, decrease incomes of groups involved in this process and make this business unprofitable in the short time. It seems obvious that the smuggling of migrants will continue as long as the European Union member states will take over the migrants in the Mediterranean Sea and transfer them to refugee centres in Europe.